Greetings and Happy Fall Equinox. 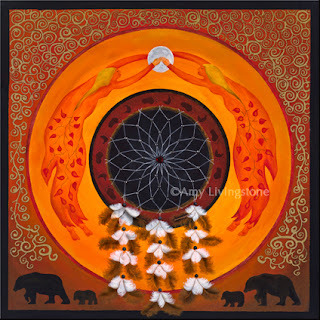 Shown here: “Harvest Moon Mandala.” The harvest moon is the moon at and about the period of fullness that is nearest to the autumnal equinox. (she was stunning this week!) Here, two goddesses hold up the moon. And as Autumn is also a time of turning our energies inward, the bears represent the hibernation or inwardness of the spirit as they march to the west which is the cardinal direction associated with the Fall. The dream catcher in the center adds to this theme where the jeweled net of Indra (from the Buddhist tradition) invites us to remember that all phenomena are intimately connected. Feeling the seasonal shift approaching. That instinctual turn inward like nature herself as the garden begins to die back. Autumn is my favorite season and love rising early before the sun, before the world wakes. 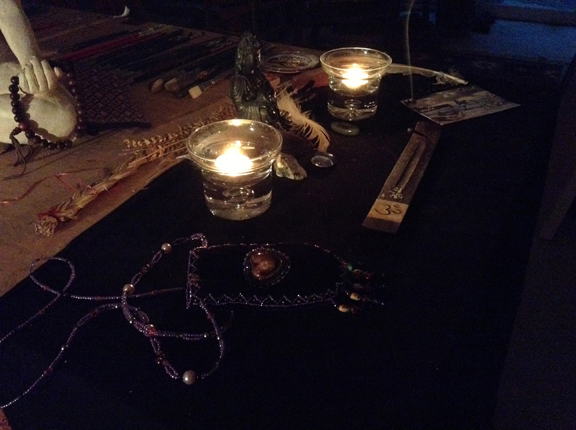 I start each morning in the studio with a ritual of lighting candles, making an offering of incense, and saying a prayer (or an intention) that my work may serve the healing of the Earth. May it be so. Through my mind to my hand.